"Our double-sided coupon templates are similar to those that you may have seen at the entrance at nearby grocery and retail stores, restaurants or perhaps you may have received one in the mail." Our eye-catching, full color and printable coupon template is sized at 11 x 8.5 (landscape orientation when printed). These templates are double-sided and have a total of 18 advertising slots. There are 9 ad spaces on one-side and 9 more ad spaces on the reverse side of the template. Each template can also be customized to include your region, company name, logo (or any image including your advertiser's business card), address, website, phone, email and fax. 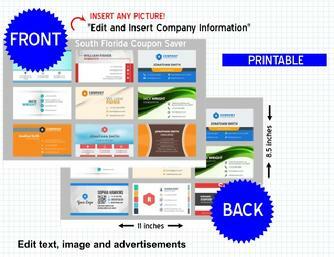 All coupon templates are instant downloads and are 100% editable so that you can easily insert your "sold" advertisement into (or up to) 18 revenue generating advertising spaces. Yes, I want to submit my one-time secure payment for this Start a Coupon Business Program Kit! BONUS #1: After you submit your secure online payment, you have the option of arranging a half hour call with one of our coupon experts. On this call they will answer any questions that you may have about setting up your business and promoting your local coupon business! BONUS #2 and #3: Receive two customizable eDownloads are included with your online purchase: The "Direct Mail Sales Letter" can be used when sending and attracting new coupon advertisers. This letter will help to compliment your other sales and marketing efforts that may include outbound and in-person cold calling, online and offline advertising, networking and asking for referrals. The "Coupon Advertising Contract" is a binding contract between you and your advertiser. The contract also includes other information such as distribution location and dates of distribution, advertising size and rates, deposit and final payment, returned check fees, supplied artwork and your right to refuse advertising. BONUS #4: You will also receive a 10-page "Word for Word Coupon Cold Calling Script" that you can use on the telephone and in-person when speaking with local business owners in your market. We have a strategic partnership with a company called Mr. Cold Call, Inc. (www.mrcoldcall.com) and we worked with them to create a customized cold calling script that includes opening lines, engaging questions, objection handling, closing questions and voice mail messages. This comprehensive script includes over 100 script combinations. BONUS #5: And finally, as a final bonus, you will get an "Advertising Rates and Spec Sheet" can be used as an internal reference guide to pre-sell coupon advertising space for months at a time.